This smoothie is for all the coconut lovers out there, myself included. Coconut products such as coconut water and coconut oil are rising in popularity due to the increased awareness of all their wonderful health benefits. Part of my inspiration for this recipe was an article I came across on Australian supermodel Miranda Kerr, who revealed her love of coconut oil. She takes four tablespoons a day. To some that may seem extreme, but for those in the know, it’s a healthy habit. I personally consume copious amounts of coconut oil like Miranda, and cook almost exclusively with it. There you have it, coconuts are the bomb! 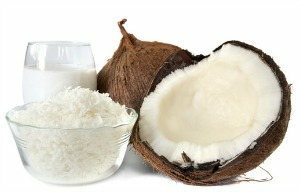 If you want more information on this miraculous food, check out my article: The Numerous Health Benefits of Coconuts and Coconut Oil. I had this smoothie for breakfast and it kept me satiated well past my normal lunch time. Feel free to use a banana instead of an avocado to thicken. Enjoy! Place all of the ingredients into your blender and blend for around 30-45 seconds or until your desired consistency is achieved. Let me know what you think of this creamy coconut smoothie by leaving a comment below. Happy Blending! Hi,I copied this creamy coconut smoothie on a recipe along with about 6 or 7 other smoothie recipes and I would like to make and drink this recipe but it seems high in carbs and sugar lucky for me my magic bullet and the cups that come with this machine are just the right amount to make a medium size drink that will fill me up in the individual size cups. But I was just wondering if this smoothie is OK for diabetics to drink only once in a while.I love coconut water,coconut light milk,and the coconut meat. There are a lot of your healthy smoothies on your website that I have yet to start making them in my blender.I know that as soon as I make your smoothies in my blender my mom is usually close by and then she will ask me to make her one of your smoothies as well. I will let you know soon how much we enjoy drinking this creamy coconut smoothie. This smoothie should be fine for diabetics to consume once in a while. However, you can omit the honey to reduce the sugar by about half. hi,thank you for replying to my letter that I sent to you about the creamy coconut smoothie,and I am not going to put honey in this smoothie. can I put stevia in this smoothie recipe? Yes, stevia is a good option for sweetening this smoothie. hi,i was wondering if I could use coconut milk instead of coconut water in your creamy coconut smoothie. Sure, coconut milk is a great option, Kim.